In his book, Why Diet and Exercise Fail, author Daniel Korn examines the myths of fat loss and attempts to uncover the true reasons why obesity rates in America are at epidemic proportions. Korn questions current theories and beliefs about weight loss and cites many scientific studies to support his ideas that these concepts are actually wrong. Additionally he puts forward some interesting and unconventional hypothesis as to what are the true causes of stubborn weight gain. Why Diet and Exercise Fail is not a weight loss program in the traditional sense but rather is an exploration of the reasons why modern Americans have so much difficulty losing weight. The book includes three sections. Korn observes the eating and lifestyle behaviors of different cultures and notes that while some cultures eat a diet that goes against conventional weight loss recommendations, they remain slim and healthy. For example, people in Thailand consume 80% of their calories from white rice, a refined carbohydrate, yet remain free of obesity and chronic disease. The French consume higher levels of saturated fat than Americans but the prevalence of obesity is 70% less. In this way, Korn systematically aims to bring into question common theories or myths of weight loss by providing examples where they don’t apply. This section explores the current theories in relation to weight loss and provides information about the side effects of various common drugs and how they affect weight gain. Korn outlines new theories about factors he proposes to be the true causes of stubborn weight gain. He proposes that the biggest things influencing weight gain are caffeine intake and sleep deprivation. He also makes the point that they go hand in hand because a high intake of caffeine causes insomnia, which then causes more caffeine intake because you are feeling tired due to lack of sleep. Other elements he believes play an important role in the modern obesity epidemic include food additives, soda (including diet soda), toxins and refined foods. In an attempt to address the situation Why Diet and Exercise Fail does not prescribe a specific diet but does make some general recommendations. Korn suggests eliminating caffeine, emphasizing high-nutrient, preferably organic foods and ensuring the intake of essential omega 3 fats is adequate. Organic fruit and vegetables, whole grains, grass-fed meat, free-range chicken, wild fish, organic dairy products, rice bran oil, wheat germ oil. Why Diet and Exercise Fail challenges the idea that exercise is of major importance for weight loss and supports this theory with scientific research. 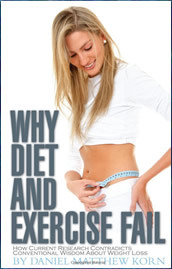 Why Diet and Exercise Fail is available in paperback format for $14.95 and e-Book format for $7.95. It is also available to read online for free at the author’s website. Encourages consumption of high-nutrient unprocessed foods. Discourages consumption of caffeine and soda. Encourages the intake of healthy fats. Addresses how sleep deprivation and stress can contribute to weight gain and other health problems. Asks readers to question their assumptions about weight loss. Includes interesting research that may not be well publicized. Available for free on the author’s website. Does not include a practical weight loss program. Author’s conclusions go against most of the current paradigm in relation to effective weight management. Author does not provide sufficient evidence to show that caffeine is a primary contributor to weight gain. Why Diet and Exercise Fail takes a look at the common theories and myths about what works for weight loss and provides scientific research that brings these ideas into question. In opposition to the general beliefs related to common diet and exercise recommendations, the author offers an alternative view proposing that factors such as caffeine, sleep deprivation, stress and toxins are the true cause of the current obesity epidemic.